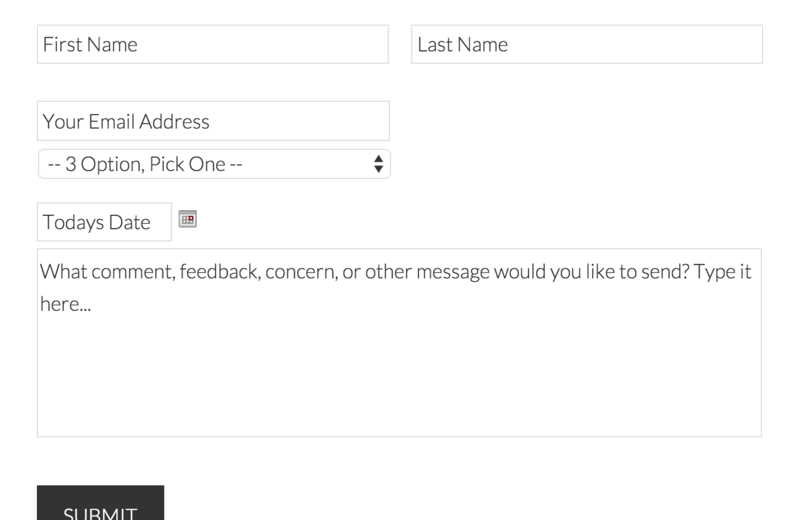 With Gravity Forms, WordPress form builder plugin, version 1.9, they added the ability to use placeholders. Giving you the option to display field labels or just use the placeholder. I love this feature because I can use less space with my forms, and make the design cooler! As depicted below, the red circles indicate Placeholders and the green squares are field labels. So placeholders are the text inside the actual filed that disappears when you click in the field to start typing. Adding placeholders is simple, when editing the field go to the “Appearance” tab and the first option is “Placeholders”. Just populate the field with the text you want to display. How do I only using Placeholders? This was the tricky part. In version 1.9.1 they decided to hide the options that allow you to hide the field labels and sub labels. Why they did this, I have no idea! It doesn’t really make sense to me, but thankfully you can override the default with one line of code you add to your themes functions.php page. 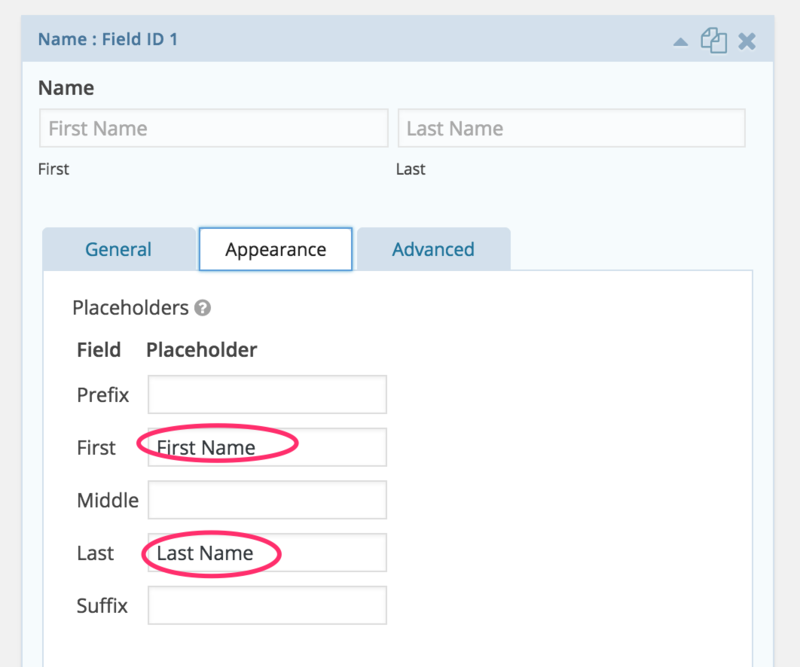 When you select “Hidden”, the field label is removed from the the form. You can also hide the Sub-Labels as well, for the fields that support sub-labels. Below is the updated from with field labels removed from all fields. 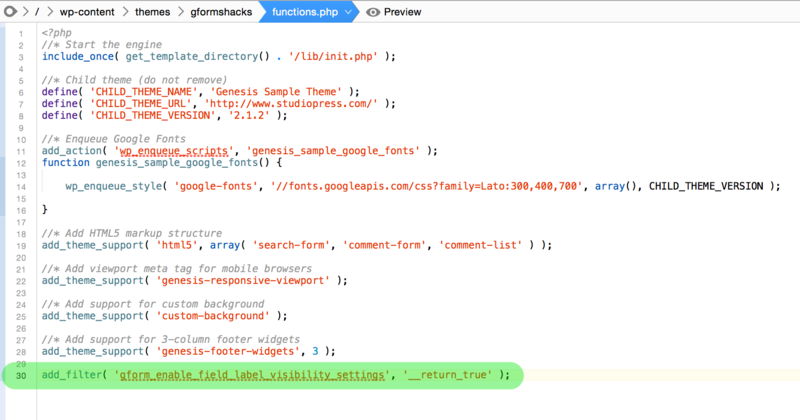 This is the one line of code you need to add to your functions.php theme file to allow you to hide field labels. Just copy and past it into your functions.php file on it’s own line. That’s it! Add that one string of code and you’ll have the ability to control field labels and take full advantage of Gravity Forms Placeholders! Question? Need help? Use the comments below! But with Dynamik and Beaverbuilder I copied it, but strangly enough it does not work. This was fabulous! Just what I needed as other placeholder plugins broke other important features in GF1.9. BUT one thing this code seems to deactivate also is the ‘required’ option. Without the label GF ignores the ‘required’ option and allows users to move on. Do you know why or have a fix? Hey, glad that this was helpful! I believe the issue isn’t that it ignores the “required” feature, rather because the field has a “placeholder” the field is technically populated. Thanks for bringing this up, I hadn’t tested it. Is this still an issue? I’m not seeing this as a problem. Just tried this. Works in the GF editor and preview, but not on the site itself. You added the line of code to your functions.php file? Yes. Now Gravity Forms is broken, even after removing the line of code. . Moving description labels, using custom classes, etc. will only display correctly in Preview mode. None of these changes appear on the site itself. I’ve trashed and recreated forms, trashed and re-installed GF. It appears permanently broken now. Did you try deactivating all plugins except for gravity forms? Is no conflict mode enabled in the Gforms settings? Great post, thanks! Do you know if there’s a way to hide the sub-label fields? Hey Brian, by following the tutorial in this article, it should also add the option to hide sub-labels. I don’t have the option to hide in that dropdown you are talking about. Does it only appear when you add the line of code in this tutorial? Thanks in advance! Yes. You have to add the code first!! Some people say because of accessibility. People who are blind or have poor vision and use screen readers to navigate, will not be able to read the form fields. Works perfectly – thanks for sharing! Hi Chris, this worked perfectly thank you so much. This plugin will allow you to safely add code snippets to your functions.php file without having to use the functions.php editor. Also, Chris, I hope you don’t mind, I would also like to share http://www.trydivi.com. It’s a free resource I have set up for anyone that wants to try the greatest page builder/visual editor and theme on the market. It works fantastically with Gravity Forms and also has a plugin to help you style gravity forms in-line with the Divi theme. Great post and so simple to use. It works a treat. I have your above advice bookmarked for all the sites I develop. Thank you kindly. I can’t count how many times I’ve used this tip. Thank you kindly! This is a great option but after adding the code the site broke, I had to remove it from cPanel to activate the website again. Can you tell me why is this happening? I did add security to the website but as I tried to do it in the cPanel it happened again. You added this code to your functions.php file and it broke the site?. I added the code and everything worked fine, but I would like to remove it and make the field labels visible again as they aren’t right now. I did delete the code from my Functions.PHP, but they are still unvisible. How could i get back to how it was? After removing the code, did you go back to the “How do I only using Placeholders?” section and switch it back and resave the form? Does this still work? I’m using GF 2.0.7 and after I added the code to functions.php, I still don’t see the option to hide the labels. I just used it last week so I’m pretty sure it does. 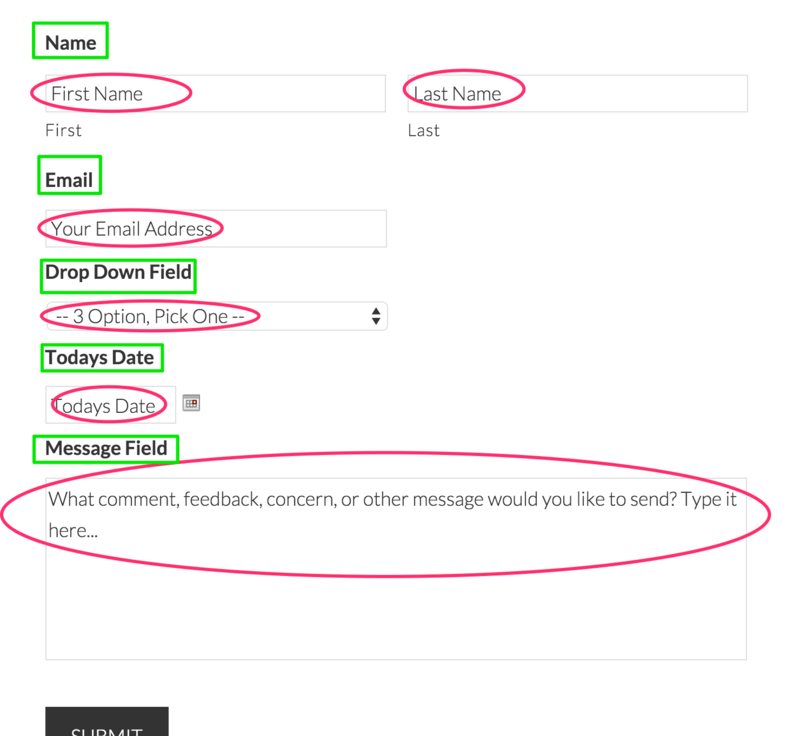 If you want me to take a look, you can send a screen shot of your functions page and a screenshot of your gforms options. Hi. Was able to remove the field labels using the code snippet. Worked great but I have a gap between my fields which I’m guessing is the space where the field label would be shown if it wasn’t hidden. Is there a way to remove this gap so the fields stack on top of each other with little space between (say 5px)? I’m not great with CSS. Hey Joe, yeah you will have to use CSS to adjust your form style. There are great tips here => https://www.gravityforms.com/styling-forms-wordpress/ and a plugin you can try with the customizer.